New collaborative research, carried out by Dr. Vitaly P. Panov, Research Fellow, and Jagdish K Vij, Honorary Professor of Electronic Materials of Trinity College Dublin's School of Engineering, Department of Electronic Engineering, has found the twist bend nematic phase of liquid crystals (LCs). The findings, are published in the leading scientific journal Nature Communications. A series of papers published by the group of Professor Vij in Physical Review Letters and Applied Physics Letters with Dr. Panov as first author formed the basis of this fascinating discovery. The discovery was made possible by international collaboration with two groups of chemists from the United Kingdom – those of Professor Georg Mehl (Hull) and Professor Corrie Imrie (Aberdeen) – and by the groups of Professor Oleg D. Lavrentovich and Professor Antal Jakli at the Liquid Crystal Institute, Kent State University, Ohio, USA. The work revealed a novel type of liquid crystalline 'nematic phase' called the 'Twist-bend nematic'. Nematic phases are characterised by molecules that have no positional order but which tend to point in the same direction. In the new phase, the molecules start to self-assemble at a nano-level with a pitch, or spacing, of 8 nm, which is thousands of times smaller than the thickness of human hair. These form unusual periodic domains at the macroscopic level when confined in between two specially treated glass plates. 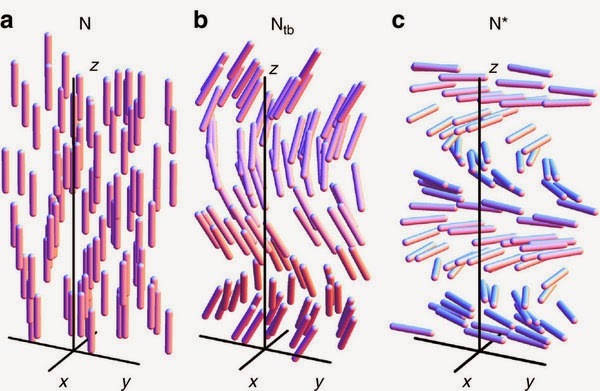 The major advantage with this new discovery is that self-assembly into periodic structures is spontaneous, without application of an external electric or magnetic field. Liquid crystals are a state of matter which possess properties both of liquids (ability to flow) and of solid crystals (order and anisotropy). Because of their unique physical properties liquid crystals are used in the electronic displays of computers, televisions, cell phones and portable gaming devices that have led the ICT revolution. Researchers are optimistic that the new nematic phase with all its twists and bends will enable new technologies, ranging from faster-switching electro-optical devices such as displays, to biological sensors. It could enable LCs to stay ahead of other competing technologies. The phase already shows some fascinating patterns when viewed under a polarizing microscope and under the action of the electric field.